Don Alvaro and the beautiful Leonora plan to elope, but when her father is killed by a stray bullet from Alvaro’s gun, it triggers an inescapable chain of events. Forced to flee as they are pursued by her brother, who has sworn vengeance, the characters are thrown together and torn apart in a series of coincidental meetings. The other-worldly presence throughout, of the carefree Preziosilla, provides a constant reminder that the force of destiny really is unstoppable. 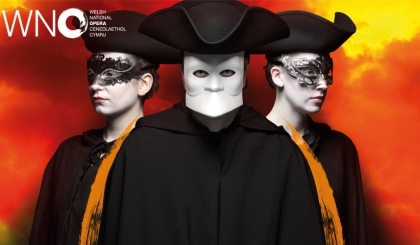 Verdi’s epic opera is told through a rousing score that includes the instantly-familiar Overture popularised through its use in classic film scores and advertisements. This new production – directed by WNO Artistic Director, David Pountney, and conducted by WNO Conductor Laureate Carlo Rizzi – marks the beginning of a three year partnership with Theater Bonn to bring new productions of some of Verdi’s greatest operas to the stage. Sung in Italian, with English and Welsh surtitles. Please note, there will be one interval of 25 minutes, between Acts 2 and 3.